Facility Modification Protect your investment. Upgrade your maintenance facility. We will modify your existing maintenance and parking facilities to provide scalable solutions that will protect both your investment and your employees. We will evaluate your needs for ventilation, electrical, heating, monitoring, and detection systems. We’ll also provide creative and scalable solutions that fit your budget and needs, while ensuring your facility will meet local and national code requirements. 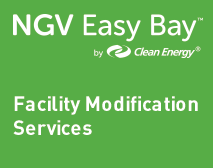 Making cost-effective modifications is an essential part of maximizing the benefits of your switch to NGVs.